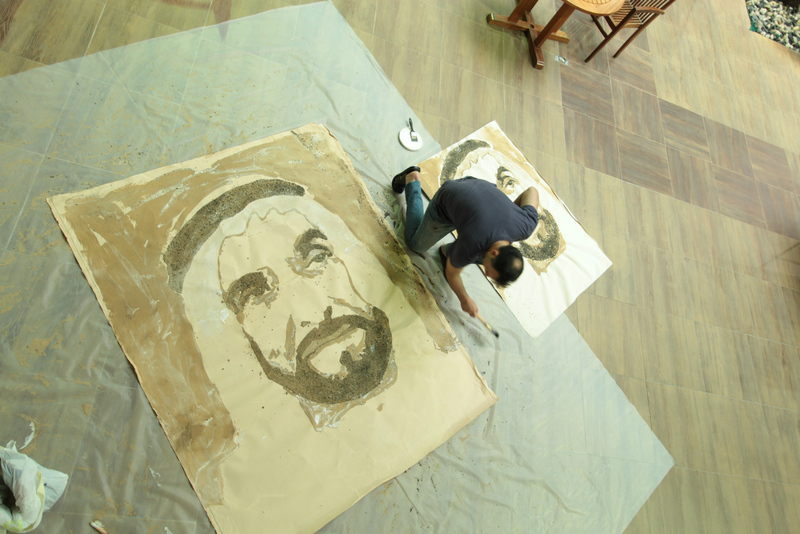 Internationally renowned artist and Canadian University of Dubai lecturer Sylvain Tremblay is making final preparations to create the largest ever portrait of the late Sheikh Zayed out of sand. The painting will be created in the desert just outside Dubai on May 12th when Tremblay, who specialises in creating artworks that celebrate culture and traditions around the world, will drop sand collected from the desert onto a 10m by 10m canvass from a hot air balloon 15 metres in the air to create a high contrast image. The technique is one invented by Tremblay himself, a style he developed and honed at Canadian University of Dubai. Using the University’s roof as a preparation space, he has practiced many times on smaller canvases to ensure everything goes to plan. This week he will attempt a trial run in the desert and he admits that this is the most challenging project of his career. “This is the most inspiring thing I have done and definitely the most technically difficult,” he said. “We are dealing with the elements of the desert and I will be floating between 10 and 20m above the ground, so there is plenty of opportunity for things to work against us. “The technique is one I first tried at an inventors convention in Abu Dhabi, but Canadian University of Dubai have supported me as I perfected it.